Got a secure job and don’t think you need an emergency fund? Here are 13 reasons why you might want to rethink that position. We live in a world of just in time everything, from logistics to pay cheques. Such a finely balanced system can be a boon. For example, retailers holding only the stock they need for a few days means they’re not putting their money into stock that might sit in a store room collecting dust for months. But what happens if that next delivery is delayed? Retailers can’t run a business with empty shelves. It’s the same if you’re living pay cheque to pay cheque. Everything is great while the money is coming in but what if it stops, or reduces? What do you do if you don’t have an emergency fund? If you’re intent on being well prepared for any kind of financial emergency, you need an emergency fund. 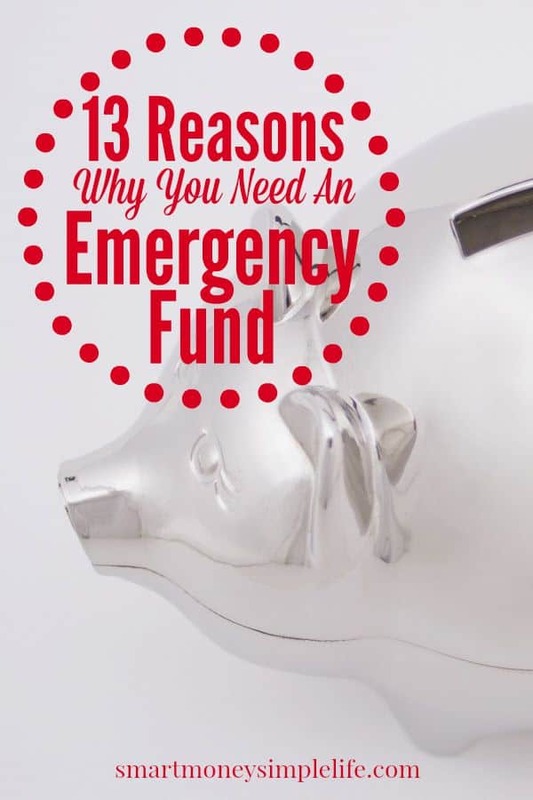 If you need convincing, here are 13 reasons why you might find yourself in need of an emergency fund. There are any number of reasons why you could lose your job or have your hours of work cut. It doesn’t need to be an Apprentice-esque “You’re fired!”. You’re actually more likely to be caught in the next round of company lay-offs, unless of course, you’re on The Apprentice! In a turbulent economic environment, job loss can happen without notice. Even the Australian (now former) Prime Minister, Tony Abbott, is not immune. A health related budget crisis can be as simple as a complicated pregnancy. Especially if that partner contributes to the household income and is no longer able to work. Other reasons health can be an issue include chronic conditions like diabetes or depression or even work-related burnout. Do you have the money available to move at a moment’s notice should the need arise? Some of the reasons a move might be necessary are: you need to move interstate or to another city to get a job; the house you’re renting is sold; you need to escape a toxic relationship. Some car repairs you just can’t plan for like having to replace a head gasket because the oil dip stick wasn’t replaced properly when you checked the oil. Without an emergency fund, you could be off the road for weeks while you save up for the repairs or adding to your debt burden to get your car fixed now. Even with the best health insurance there’s always something that’s not covered. Ambulance transport is something many people don’t consider and it’s expensive! An emergency fund can take the pain out of these acute and unexpected health expenses. An unexpected death can cause financial hardship and not just in funeral costs. Funerals can require you to travel with little notice and therefore no chance to take advantage of most discounts or deals. Funerals aren’t cheap either. Like unexpected car repairs, some house repairs can sneak up on you, too. For instance, a torrential downpour can be the only way to know you have a leaky roof. But, by then, it’s too late and it’s not just raining outside but inside, too. The damage caused can be extreme. And expensive. Like every other member of the household, pets can get sick or be involved in accidents. Even if you don’t subscribe to taking extreme measures for your pets, there are still going to be bills to be paid. This experience will be painful enough without having to also figure out how to pay for it without going into debt. When you’re self-employed, getting your tax right can be a constant worry. Make sure any mistakes don’t cost you too dearly by having the money to cover any possible errors in your tax bill in your emergency fund. It’s not just funerals that can cause you to travel at a moment’s notice. You might need to provide emergency care for a loved one or even crisis support for a friend. Or, attend a shotgun wedding! Continuing the family crisis theme, you might need to offer support of a more tangible nature like having an elderly parent move in with you. Are there changes you’d need to make to your home to make everyone comfortable? Would supporting another adult impact other areas of your budget? Of course, there’s always the Boomerang Generation to consider, too. How would it impact your finances if an adult child returned to the nest? You might never have to face any of these events in your life. You might just be that lucky! But, chances are you’ll face a couple of them. Although, (hopefully) not all at the same time. My own emergency fund has come to my rescue a number of times. It doesn’t matter how well or how carefully you think you’ve planned, Murphy always has a surprise waiting for you. Usually when you least expect it. The general rule of thumb is that you save a minimum of six months’ living costs as an initial goal. Once you’ve reached that point, you’ll be in a good position to weather most financial storms that come your way. But don’t stop saving until you reach one full year of living costs. Then, you’ll be ready for anything. How good would it feel to know your emergency fund is ready to come your rescue whenever you need it? Start saving now!